Optimizing the space you have can be a challange, no matter the size of your property. However, the lack of available space can become an especially difficult problem in smaller properties. Built in furniture is an option that will save valuable floor space, while letting you keep the room fully functional. While you can go the route of limiting the amount of things you put into each room or simply deal with a large amount of clutter. On a daily basis, kitchens, living rooms, and even bedrooms are often where meals happen, while the dining room is reserved for special occasions. It is nice to have a dining room set that will loo just as good when it is time to pull out the fine china and silverware. In many modern households, eating occurs all over the place. If the room is small, the most simplistic dining room furniture set is nothing more than a table an a few chairs, that is probably all you want in it. Having enough room for everyone present to be comfortable is the most important aspect of a nice meal. When dealing with limited space, to keep it simple is the best way to get elegance. A dining room set of smaller rooms is much easier on the budget than it would be for a large room. Since there are fewer pieces of furniture to purchase, many people do not mind paying a little extra for each item. Quality is preferable to quantity in this case. There is for the basic dining room set. A formal dining room set can be rather expensive and will definitely require a descent amount of space. However, there is no finer way to entertain for those with the room and the budget. A formal dining room furniture set is made up of a table large enough to seat a minimum of six, chairs, and a buffet. 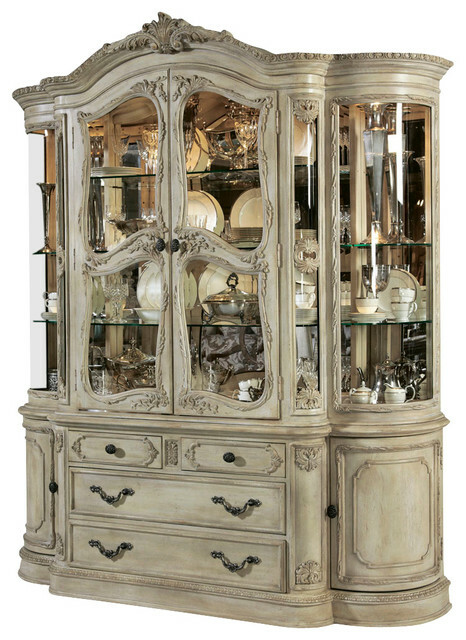 A china cabinet is also a good idea for extra convenience if you have the space. Table space becomes a big issue when dealing with a large group of people. It takes a lot of food to feed a large party, and the buffet is there to bear the brunt of the load. Once again, pleasing the guests is the most important part of the meal, and while a table filled to the edges with food might look good, it does not leave enough room to dine comfortably. Rectangular tables are generally a better fit than round or square ones when dealing with a large group of people. Rectangular tables have less dead space in the middle. A square or circular table will certainly have more room for a centerpiece, but a large centerpiece is not always a great idea anyway because it may block people’s view of each other and hinder conversation. You want your dining room set to be comfortable whether you are going for classic, contemporary, or country. The most common materials for tables are wood, metal, and glass, and they can all look great. Good heavy hardwoods have been doing for centuries if you want your dining room set to last a long time or possibly be passed to the next generation. Pick out something that appeals to you as opposed to something that will look good where you are putting it when shopping around for furniture. Dining room or otherwise, is a big investment, and it can also be moved to other settings. If you buy a new house or if the set is eventually going to be in another famil member’s home, it will not matter what the original room it was placed in looks like. Match the room to the furniture, not the other way around. The dining room often contains the most elegant pieces of furniture in the house. Since they are in a place that is considered formal, dining room chairs and tables are typically made to very high standards, with a price tag to match. If you want to use hardwood dining room chairs and table, no matter the particular species, a new hardwood dining room chair is going to be mederately expensive. The price is certainly a major consideration when shopping around because you will need at least four of them. Table are just as expensive, but most only need one of them. The combination of table and chairs make up the most basic dining room set. Most people will purchase at least these items together for both cohesion and the slightly lower price you get when buying a set, as well. The value tends to increase with age if well maintained. A dining room chair or table that has been passed down for a few generations, and has been taken care of, is very likely to gain value. Some species of wood (like black walnut) that used to be readily available are now quite expensive due to their rarity. In other cases, it is craftmanship, not the wood’s availability, that drives up price. Due to hardwood’s durability and desirability, many savvy homeowners are looking to less conventional places to find quality furniture at a good price. Buying new furniture often seems to cost more than we imagine it will. Any piece is worth only what you are willing to pay for it. To some, it is worth the extra money to buy furniture new so that it is in pristine condition. For others, finding items that are slightly damaged ata a cheaper price is a better option. It is a wise investment when finding pieces that are a little banged up, but still sturdy and functional. If you want a professional touch, it is possible to find contractors who specialize fixing and refurbishing such pieces. You may enjoy doing the work yourself or with a friend’s help if you have some experience. Either way, it is very possible to end up with some great furniture (that carries a little history) for the same price, or even less, than the cost of buying new and less interesting pieces. For dining room buffets, unfortunately are becoming less common. The once near necessity of dining room buffets are not needed in many modern homes since so much eating is done in different areas of the home (and frequently family members eat at different times). Dining room buffets are large pieces of furniture that contain a lot of wood. New and old ones alike can be very expensive and are generally very beautiful. Keep your eyes peeled for this wonderful piece of furniture when going through flea markets and thrift stores. Talk about an item worth salvaging. To set up a pleasent and organized work space, you do not need a home office or a space room. Installing a built in desk into a kitchen, a space bedroom, or even under a staircase is a great way to create a small work area out of a small unused space. Remember that plenty of shelves and/or cabinets and drawers will help to keep the area clutter free when considering the design of your desk. Phone books, files, recipes, important papers, schdules and other information can all be stored here. Since it is a high-traffic room and is becoming more and more popular in modern homes, installing a built-in desk is beneficial in a kitchen. For keeping phone messages and keeping track of everyone’s schedules, a place for homework, or to organize and pay bills, a kitchen desk can be used as a message center. For other built-in furniture, it can take many forms, and each can bring a small space closer to its full potential. Tables that fold into a wall will provide a place to work or eat when needed, and a spot to stretch when they are not. Fold away benches and window seats can increase the amount of people that can fit comfortably in a small room without being in the way. For small rooms or cramped closets, built-in shelving, drawers, and cabinetry can be a life saver. You may laso want to try these kinds of built-in furniture in bathrooms, or living rooms to reduce clutter and store items that would otherwise be in the way. Garages are another great place for built-in shelves and cabinets. For purchasing built-furniture, it is available in varying degrees of quality and cost. If you want the best fit for the space, a custom jobis the way to go. You can often find kits of pre-fabricated built-in furniture to install yourself. It will certainly cost more to have built-in furniture custom made, but when it coes to saving space, pieces that are designed specifically for your needs, and the specific room they are to go in are likely to do a better job of optimizing sapce, and may function better, as well! Perhaps your old kitchen cabinets are well-made and still sturdy, but cosmetically worn and torn. A good cabinet is a terrible thing to waste. Maybe you have purchased an older home with a charming kitchen full of cabinet fronts and hardware that have seen better days.